This Mid Century Modern abstract art glass sculpture is a Study In White . The black V wrought iron stand highlights the clear glass and brings out the center geometric white design. 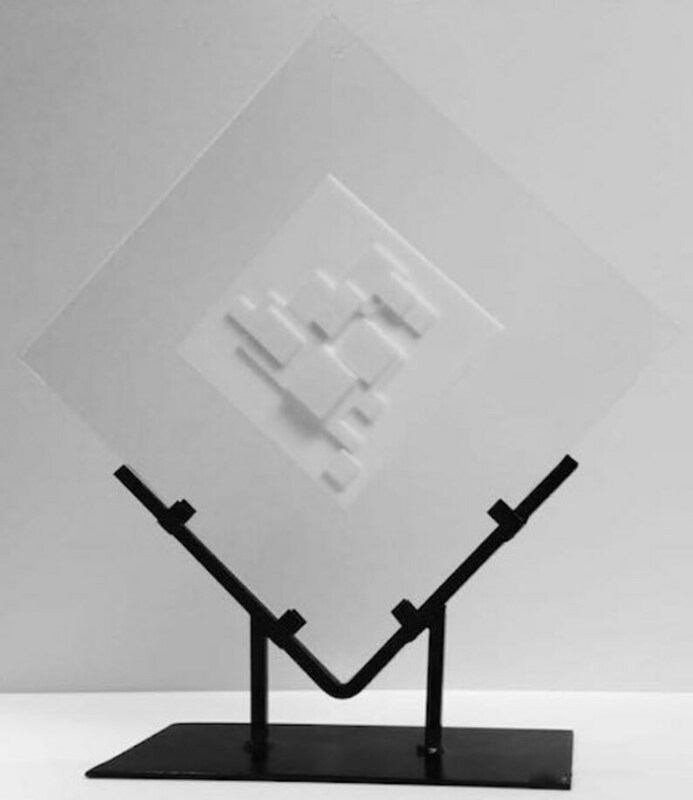 The center of the sculpture is white dimensional squares. This is a very sophisticated and striking sculpture. Where better to find that light but in your garden or home. We feel that our glass needs you as much as your garden or home needs our glass. Let the colors shine in your flowers, along your paths, in among your hardscape and seating or within your home. In order to achieve our goal we designed and had custom made wrought iron stands for proper presentation and to hold your glass securely. Many different layers along with clear give a ripple effect of colors overlaying each other. The texture of one, two and three levels makes secondary colors as colors overlay each other. This is a very striking and uplifting piece. All of our pieces are dramatically effected by the light and give different variations as you adjust their position. This Studio Art measures 14" W x 14" H for the glass itself. For photographic purposes the stand is a table top which comes with the piece. A larger stand is available at additional cost please email me for prices.